Please tell us that it's true. If the rumors are true, we should expect to see the unveiling of a Mansory-tuned Porsche 918 Spyder at the IAA Frankfurt Motor Show 2015 early next week. Although details are scant at this point regarding what the Swiss tuner may have in store, Mansory has a solid reputation for applying its tuning and accessory program to some of the most high-end vehicles in the world. Recent projects have included the Bugatti Veyron, Lamborghini Huracan, and the Ferrari F12 . Whatever Mansory may have prepared, we know that it won’t disappoint. 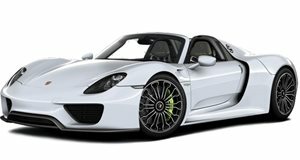 A stock Porsche 918 Spyder comes straight from the factory with a 4.6-liter V8 engine mated to a hybrid electric drive system that, combined, cranks out 887 horsepower and 944 lb-feet of torque. The car is also capable of hitting 60 mph in a mere 2.5 seconds and has a top speed of 214 mph. Needless to say, Mansory has a fabulous base vehicle to apply its skills to and we anxiously look forward to seeing what could debut in just a few more days.